The Republican primaries got me thinking about the nature of democracy. G. K. Chesterton usually has interesting insights, so, I looked up what he said on the subject. I know he's not a founding father and he's English. Still...his quotes are pretty good. Both aristocracy and democracy are human ideals: the one saying that all men are valuable, the other that some men are more valuable. Chesterton, G. K. (Gilbert Keith) (1994-05-01). Orthodoxy (p. 100). Public Domain Books. In short, the democratic faith is this: that the most terribly important things must be left to ordinary men themselves--the mating of the sexes, the rearing of the young, the laws of the state. This is democracy; and in this I have always believed. Chesterton, G. K. (Gilbert Keith) (1994-05-01). Orthodoxy (p. 43). Public Domain Books. Democracy is not philanthropy; it is not even altruism or social reform. Democracy is not founded on pity for the common man; democracy is founded on reverence for the common man, or, if you will, even on fear of him. Chesterton, G. K. (Gilbert Keith) (2011-03-30). Heretics (p. 117). But the thing which is really required for the proper working of democracy is not merely the democratic system, or even the democratic philosophy, but the democratic emotion. The democratic emotion, like most elementary and indispensable things, is a thing difficult to describe at any time. But it is peculiarly difficult to describe it in our enlightened age, for the simple reason that it is peculiarly difficult to find it. It is a certain instinctive attitude which feels the things in which all men agree to be unspeakably important, and all the things in which they differ (such as mere brains) to be almost unspeakably unimportant. The nearest approach to it in our ordinary life would be the promptitude with which we should consider mere humanity in any circumstance of shock or death. We should say, after a somewhat disturbing discovery, "There is a dead man under the sofa." We should not be likely to say, "There is a dead man of considerable personal refinement under the sofa." We should say, "A woman has fallen into the water." We should not say, "A highly educated woman has fallen into the water." Nobody would say, "There are the remains of a clear thinker in your back garden." Nobody would say, "Unless you hurry up and stop him, a man with a very fine ear for music will have jumped off that cliff." 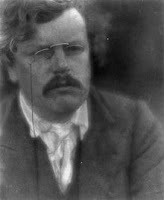 Chesterton, G. K. (Gilbert Keith) (2011-03-30). Heretics (p. 119). Everything in our age has, when carefully examined, this fundamentally undemocratic quality. In religion and morals we should admit, in the abstract, that the sins of the educated classes were as great as, or perhaps greater than, the sins of the poor and ignorant. But in practice the great difference between the mediaeval ethics and ours is that ours concentrate attention on the sins which are the sins of the ignorant, and practically deny that the sins which are the sins of the educated are sins at all. We are always talking about the sin of intemperate drinking, because it is quite obvious that the poor have it more than the rich. But we are always denying that there is any such thing as the sin of pride, because it would be quite obvious that the rich have it more than the poor. We are always ready to make a saint or prophet of the educated man who goes into cottages to give a little kindly advice to the uneducated. But the medieval idea of a saint or prophet was something quite different. The mediaeval saint or prophet was an uneducated man who walked into grand houses to give a little kindly advice to the educated. The old tyrants had enough insolence to despoil the poor, but they had not enough insolence to preach to them. It was the gentleman who oppressed the slums; but it was the slums that admonished the gentleman. And just as we are undemocratic in faith and morals, so we are, by the very nature of our attitude in such matters, undemocratic in the tone of our practical politics. It is a sufficient proof that we are not an essentially democratic state that we are always wondering what we shall do with the poor. If we were democrats, we should be wondering what the poor will do with us. With us the governing class is always saying to itself, "What laws shall we make?" In a purely democratic state it would be always saying, "What laws can we obey?" Chesterton, G. K. (Gilbert Keith) (2011-03-30). Heretics (p. 120).